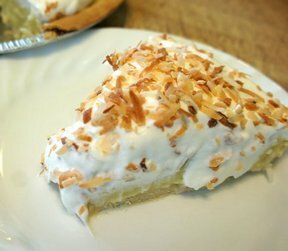 The Ritz cracker crust and the whipped cream and coconut top layer create the perfect flavor combination. 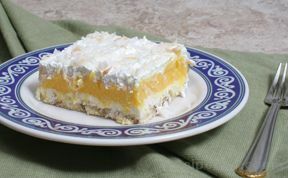 A great dessert for anyone that likes the sweet flavor of coconut. 1 package coconut - 14 oz. Crush crackers and set aside. Beat egg whites until the form stiff peaks. Add the sugar and vanilla; beat until well mixed. Finely chop the pecans; stir the pecans and crushed crackers into the egg white and sugar mixture. Put into a greased 9 x 13 baking pan and spread out evenly. Bake at 350 degrees for 25 - 30 minutes. Allow to cool completely. Beat the whipping cream until it forms stiff peaks; spread over cooled crust. 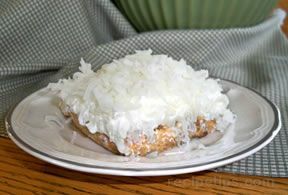 Sprinkle the coconut over the whipped cream. Serve and enjoy! "Very good! 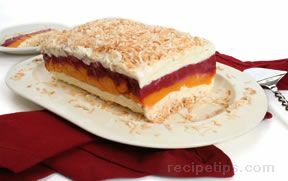 I love coconut so it is hard to find a coconut dessert I don't like but this was something different from any other recipes I have tried. I cheated though and used Cool Whip rather than whipping my own cream."